What can virtual WiFi router software do? The internet has more or less formed an integral part of our lives. It is almost impossible to go about our normal day to day business without it. Unlike the past decades when internet connection was via long network cables connected to the stationary computers, today we get connected to the internet through Wireless Fidelity, popularly known as WiFi on our laptops, phones, gaming consoles, tablets among others, hence able to move from one hotspot to the next easily. In a scenario where you have multiple devices to connect yet you only have one LAN (Local Area Network) cable and no modem. This is when a hotspot application comes in handy. With a hotspot app, you can easily make your computer a hotspot. However, you need to have the right software to do this, one that works best, stands above all the others, is user-friendly, reliable and feel confident about as the app that will get the job done. 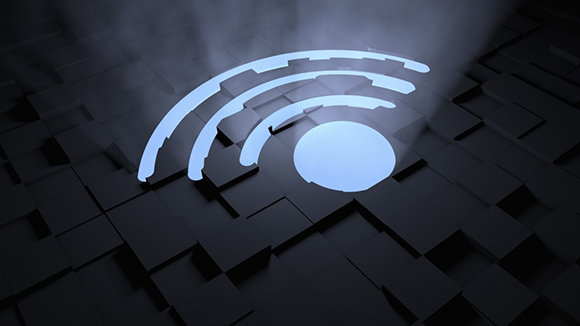 Having said that, now let’s look at the top 10 virtual WiFi routers on windows that you can use to create a hotspot. Free WiFi Hotspot is the answer to your surfing needs. With this super virtual WiFi router you’re able to create a hotspot to easily connect all your devices to WiFi. Additionally, Free WiFi Hotspot combines the connectivity merits of WiFi with excellent mobile coverage of 2G, 3G and 4G making it possible to easily set up a WiFi hotspot through a standard 2G/3G/4G modem. Similarly, Free WiFi Hotspot enables you to not only share USB tethering connection but also GPRS over WiFi. 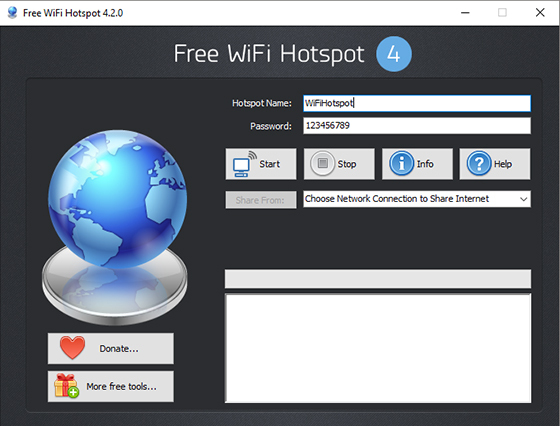 Step 1: Download and install the latest version of Free WiFi Hotspot, the best Virtual WiFi Router Software on Windows. Step 2: Launch Free WiFi Hotspot. Step 3: Set your hotspot name; this is the name that the other devices will see and connect to. Step 4: Set your password so as to protect your Free WiFi Hotspot. The unique password keeps your hotspot safe and secure by the same WAP2 WiFi security standards employed by most routers. 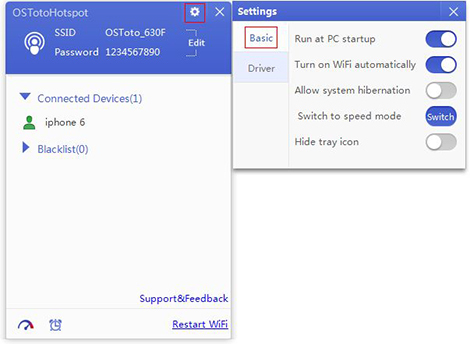 Step 5: Choose network connection that you want to broadcast using Free WiFi Hotspot from the drop-down. Step 6: You’re now ready to go, click Start to begin sharing your internet connection. Connectify is fully featured virtual WiFi router software with the ability to convert your computer into a WiFi hotspot, enabling you to connect a wide range of devices, from smartphones, tablets and other computer systems. Once you download and install it, it detects your computer’s network automatically and creates a virtual network, configures the hotspot and generates the login details for you. Connectify enables you to efficiently monitor and manage all the connected devices, with the window showing you the internet speed being consumed by every connected device. 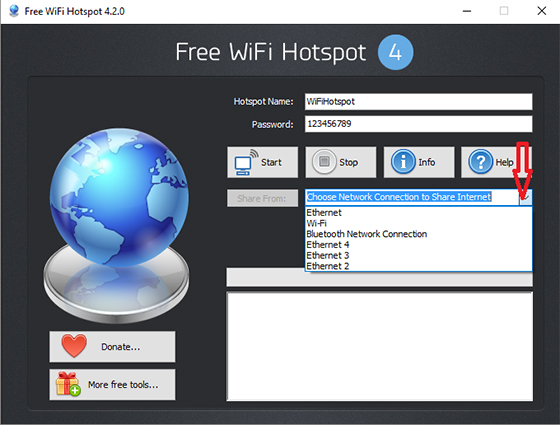 mHotspot is virtual WiFi router software known to provide a strong uninterrupted WiFi signal. In addition, it is a perfect application for the multiplayer gaming option as two computers or gaming devices can be connected using the WiFi making the gaming smooth and efficient. mHotspot can be used to identify not only the devices connected but also restrict connections by setting strong and unique passwords. mHotspot has also proven to be a good repeater hence can be used to boost the range of router’s signal. My WiFi Router is not only powerful but also a very efficient virtual WiFi router software. The reason why My WiFi Router stands out among the rest is the fact that it creates a hotspot with very strong and high range signals. 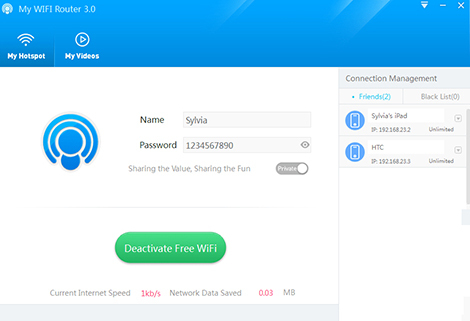 In addition to being able to share internet across multiple devices, My WiFi Router allows you to share videos and other files across all the devices connected to the WiFi network. 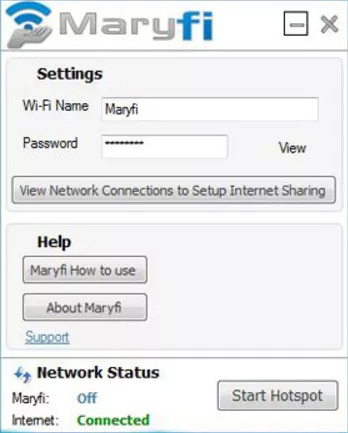 MaryFi hotspot creator is virtual WiFi router software best known for its three key features, a user interface which is simple, with only basic required aspects necessary to it without any clutter. Secondly, MaryFi provides access to shared files across multiple devices. Last but not least, MaryFi is an efficient repeater which allows the availability of WiFi signals throughout a given area. 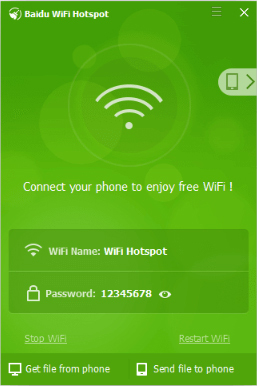 Baidu WiFi Hotspot is virtual WiFi router software that has quite a number of features which enable it to perform just like the built-in WiFi hotspot on your phone. It automatically sets the password upon installation however you can change it whenever you want. Baidu WiFi Hotspot is reliable and offers a secure internet sharing. 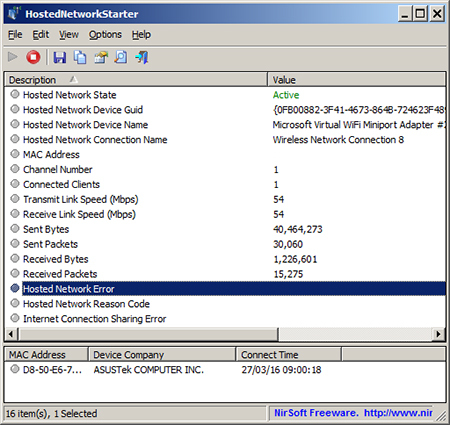 HostedNetworkStarter is virtual WiFi router software that requires no installation. It is very portable since it can be stored in various storage devices. 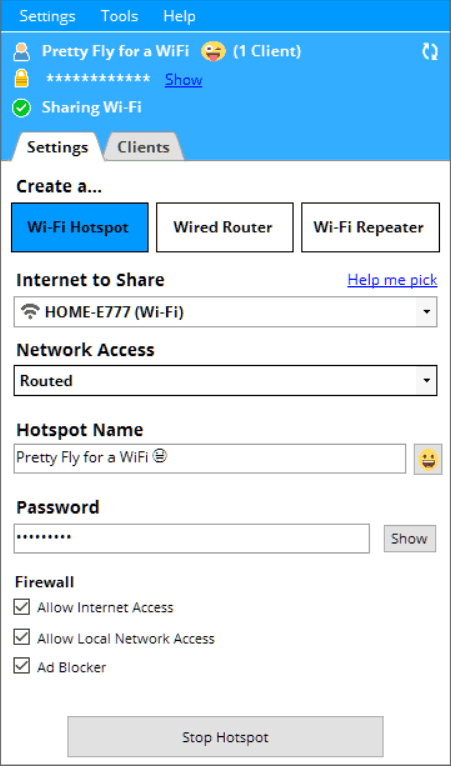 It has a GUI front-end to the command line method which is used to enable WiFi hotspot on your computer, something that makes HostedNetworkStarter an easy to use and efficient app. 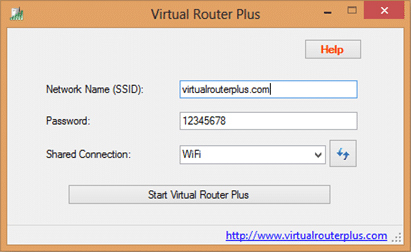 Virtual Router is virtual WiFi router software similar to HostedNetworkStarter by the fact that it is an open source and requires no installation. It runs without any background processes, performing all its functions efficiently as expected of a WiFi hotspot. Bzeek is a network program that comes with a built-in firewall meant to protect your network connection, computer as well as all the other connected devices. Bzeek has a control panel that you can use to manage devices and connections. OSToto is easy to use virtual WiFi router software which comes with an efficient interface. Apart from allowing you to manage the devices connected to it, you can rename the devices and blacklist them to stop them from accessing the WiFi. If you are looking to avoid expensive roaming charges then Free WiFi Hotspot is what you need as it will help you stay connected and won’t have to worry about whether or not you have an unlimited plan with your phone service provider. 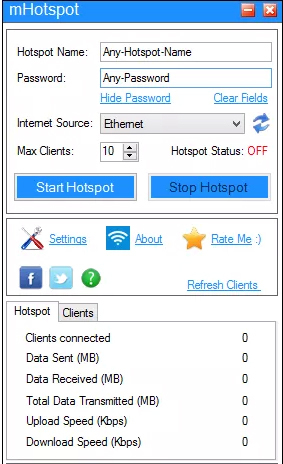 Free WiFi Hotspot guarantees no overpaying for costly connections, just find a free WiFi hotspot and log in especially when it’s time for a data-intensive session. Besides, Free WiFi router works just like a real router so won’t need to purchase a router or any other hardware to get started, it’s free, just like the name suggests.